News / Getting Started With Vein Therapy (Part3) – What is the Right Way to Handle My Compression Stockings? Getting Started With Vein Therapy (Part3) – What is the Right Way to Handle My Compression Stockings? 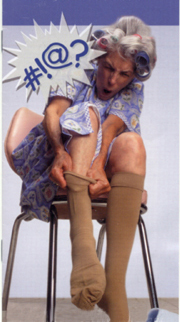 Put your compression stockings on first thing in the morning, as your legs are not yet swollen at this stage. Your shower or bath should be taken the night before. In the evening after you have undressed, your compression stockings should be laundered. One reason is that the fabric becomes stretched out and loses pressure after being worn. The other reason is that the fabric collects flakes of skin, sweat, the remains of skin cream, etc. which may attack the threads and cause the fabric to lose its elasticity. Stockings should be laundered in hot water (about 107 degrees…this restores the memory of the yarn) using a non-phosphate detergent such as one sold by the major stocking manufacturers. Other non-phosphate detergents which can be bought at your local grocery store are ERA, Tide Free and All Free and Clear. Garments can hang dried over night. Most can be dried in the dryer using a delicate setting. Under no circumstances should you dry your compression stockings in the sun or on a radiator as this will damage the stockings and reduce their wear time. HOW DO I PUT ON MY STOCKINGS? Before putting on your compression stockings, it is best to take off your watch and jewelry and wear rubber gloves, such as the donning gloves sold at Support Hose Store, to avoid damage to the fabric. The rubber gloves help grip to the fabric and make it much easier to hold and put on the stockings. When putting on the stockings, avoid overstretching by pulling excessively, as they will then not fit your leg properly. As a consequence, the pressure distribution will not be correct, and a full leg stocking will slip down like an elastic band and gather around the back of the knee. This can lead to your leg feeling strangled at the knee. Place your compression sock or stocking inside the semi-circle frame and pull the top of the stocking down over the semi-circle. The heel of the stocking must face the back of the metal stocking donner. While sitting or holding on to the edge of a table to stabilize you, insert your foot into the stocking until your foot is completely on the floor. Helpful tip:hold the heel pocket against the frame as you slide your toes into the stocking. Grasp the handles of the donner and gently pull the stocking donner and stocking up the leg until the stocking is above the calf. Try not to over-stretch the stocking. Be sure the heel of the stocking is properly placed on the foot, then adjust the length and smooth out an wrinkles by stroking and smoothing with your donning gloves on . Thigh high and waist high stockings can also be donned using your metal stocking donner with the lower leg applied in the same manner is a knee length and then pull the remaining portion into place by hand. We certainly hope these hints will help you and make donning your stockings less stressful.